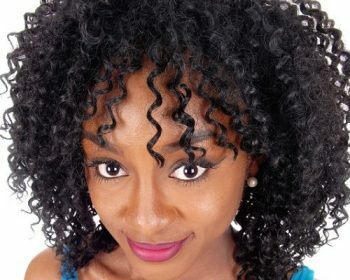 I’ve been searching for product that my mane will take to as I have dry, not so porous 4c hair (if we go by categories). 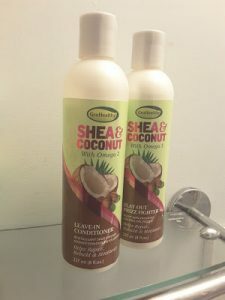 So you can imagine my delight when I was introduced to GroHealthy’s Shea & Coconut range. These beauties came just in time for wash day and I looked forward to trying them out! 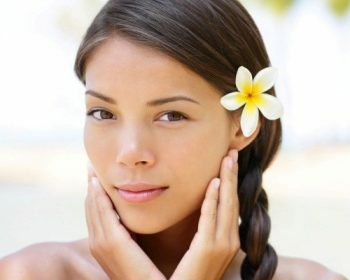 Also as a bonus they contain none of the nasty stuff like mineral oil, petrolatum, sulphates, phthalates, colorants or parabens. I’ve very recently started pre-pooing and noticed such a difference to the feel of my hair. I separated my hair into 4 sections and applied the Shea & Coconut Oil to each, leaving it in for about 15 minutes. 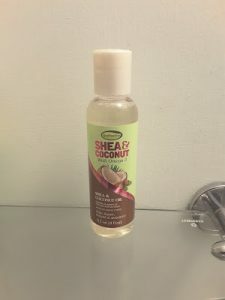 I then rinsed out the oil, shampooed with the Moisturising Shampoo and conditioned my hair in the same sections as the pre-poo using the Moisture Rich Conditioner, wrapping my hair in cling film and leaving the conditioner in for about 45 minutes. Finally I rinsed my hair with cool water and parted my tresses again into four sections to apply the Leave-In Conditioner, Flat Out Frizz Fighter and Shea & Coconut Oil respectively. Overall I like the GroHealthy range! Each product smells absolutely lush and worked well on my hair. I tend to finger detangle whist conditioning and the conditioner didn’t have the best slip on my hair but it was still lovely. 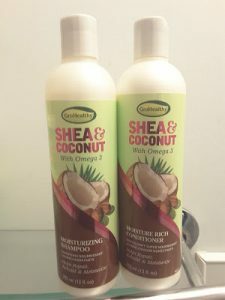 This product in particular gave a cooling sensation on my scalp which I found very soothing. My favourite quality of the GroHealthy range is the lightness of each of the products. 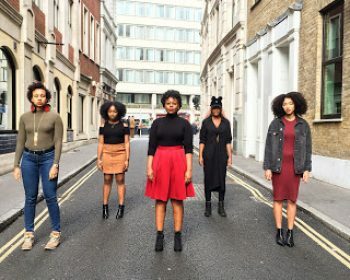 My hair doesn’t feel weighed down by any of the products, even with the Leave in – Frizz Fighter – Oil combo. Also I’ve found that my hair has more shine than it normally does and feels moisturised, without the build up. 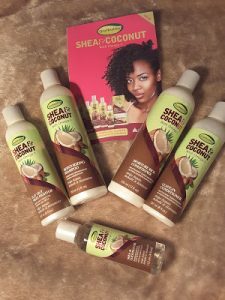 Make sure you check out GroHealthy’s Shea & Coconut range. I recommend it especially if you’re looking for something that doesn’t make your mane heavy!